Here is a recipe for chili for a crowd submitted by Mavis McDonald from Duluth MN USA. Brown ground beef with onions and garlic. Add the remaining ingredients and simmer, stirring occasionally until the beans are tender, about 1 hour to 1 1/4 hours. 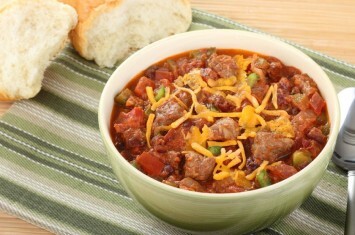 Serve this tasty chili with large bowls of grated cheddar cheese and sour cream for topping. Fresh crusty rolls or garlic bread would top it off nicely. 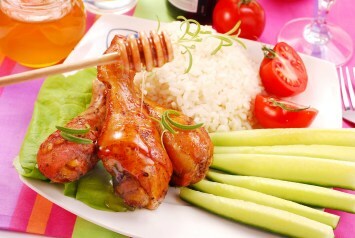 Make sure to have a few bottles of hot sauce for those who really like it hot. It sure will feed a crowd! It starts with 20 pounds of ground beef! Great for large get togethers like church suppers, other fundraising dinners, family reunions etc. If you don’t need chili for a crowd, but want a great chili recipe, look here. If you this recipe, I’d love you to Pin it to Pinterest, Tweet about it, Like it on Facebook and leave a comment below.